The Hell Roaring Fire was 100 percent contained by Tuesday morning after burning a total of 325 acres on the west side of state Highway 75 north of Pettit Lake. Firefighting agencies coordinated an aggressive response because the fire was burning in forest with a significant amount of dead and fallen timber, near structures and recreational sites. Highway 75 is open, as are the majority of trails, campgrounds and recreation sites on the Sawtooth National Recreation Area, including those at Redfish, Stanley, Alturas and Pettit lakes. 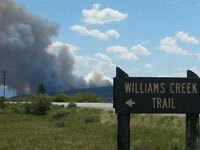 The area closure implemented during the Hell Roaring Fire remains in effect on the western side of Highway 75, directly across from the Williams Creek Trailhead, which includes the Hell Roaring Trail and the southern portion of Forest Road 210 from Hell Roaring through Decker Flat.